Thinking about entering the field of teaching? 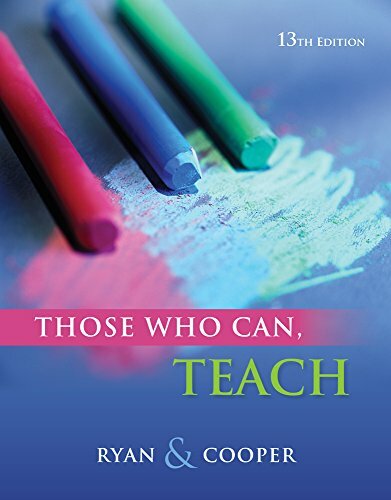 When you enter a teacher education program, be sure to read THOSE WHO CAN, TEACH, Thirteenth Edition. This book's state-of-the-art and reader-friendly approach will help you make an informed decision about becoming a teacher. Using multiple sources, including biographies, narratives, profiles, and interviews with top educators and scholars, the book exposes you to the realities of teaching. The acclaimed author team's direct, conversational tone invites you to reflect on the satisfactions and problems of teaching in the United States, and casts a teaching career as a positive challenge. Kevin Ryan, Ph.D., Stanford University, is Professor Emeritus of Education at Boston University School of Education. He is also the founding director of the Center for Character and Social Responsibility. A former high school English teacher, Dr. Ryan was a tenured faculty member at the University of Chicago and the Ohio State University before moving to Boston University. In 1970 Ryan was granted an Alfred North Whitehead Fellowship at Harvard University. Since then he received the Boston University Scholar-Teacher Award, the National Award of Distinction by the University of Pennsylvania Graduate School of Education, and the Paideia Society's Award for Educational Excellence. Ryan has written and edited 22 books and over 100 articles on teacher and character education. He is also the author of TEACHING FOR STUDENT LEARNING: BECOMING A MASTER TEACHER (with James M. Cooper, ©2012, Cengage); THOSE WHO CAN, TEACH, 14th Edition (with James M. Cooper and Cheryl Bolick, ©2016, Cengage); and the editor of KALEIDOSCOPE: CONTEMPORARY AND CLASSIC READINGS IN EDUCATION, 13th Edition (with James Cooper, © 2012, Cengage). Ryan, Kevin; Cooper, James M.